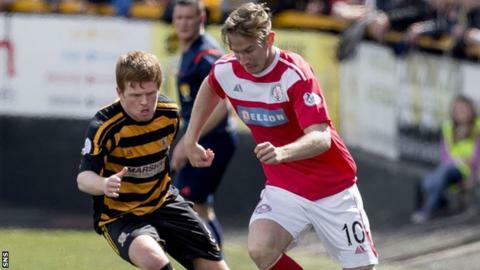 Alloa Athletic progressed to the Scottish Championship play-off final, despite losing to Brechin City at the Indodrill Stadium. The Wasps held and were comfortable in the first half. However, Brechin halved their deficit when Alan Trouten struck. The visitors knew another goal would force extra-time but Alloa held on and will face Forfar Athletic over two legs, the first on Wednesday. Match ends, Alloa Athletic 0, Brechin City 1. Second Half ends, Alloa Athletic 0, Brechin City 1. Attempt saved. Alan Trouten (Brechin City) right footed shot from outside the box is saved in the top centre of the goal. Attempt missed. Liam Buchanan (Alloa Athletic) right footed shot from a difficult angle on the right misses to the right. Attempt missed. Robert Thomson (Brechin City) header from the centre of the box is too high. Substitution, Alloa Athletic. Steven Hetherington replaces Iain Flannigan. Corner, Brechin City. Conceded by Ben Gordon. Attempt saved. Ryan McCord (Alloa Athletic) right footed shot from outside the box is saved in the bottom right corner. Goal! Alloa Athletic 0, Brechin City 1. Alan Trouten (Brechin City) right footed shot from the centre of the box to the bottom left corner. Assisted by Bobby Barr with a cross. Attempt saved. Kevin Cawley (Alloa Athletic) left footed shot from the left side of the box is saved in the bottom left corner. Mark Docherty (Alloa Athletic) wins a free kick in the attacking half. Corner, Brechin City. Conceded by Kyle Benedictus. Corner, Brechin City. Conceded by David Ferguson. Attempt blocked. Robert Thomson (Brechin City) right footed shot from the left side of the box is blocked. Corner, Brechin City. Conceded by John Gibson. Corner, Alloa Athletic. Conceded by Darren McCormack. Liam Buchanan (Alloa Athletic) wins a free kick on the right wing. Attempt missed. Bobby Barr (Brechin City) right footed shot from the left side of the box is just a bit too high. Substitution, Brechin City. Craig Molloy replaces Callum Tapping. Corner, Alloa Athletic. Conceded by Paul McLean. Attempt saved. Gerry McLauchlan (Brechin City) right footed shot from the centre of the box is saved in the bottom left corner. Attempt saved. Robert Thomson (Brechin City) header from the centre of the box is saved in the bottom left corner.